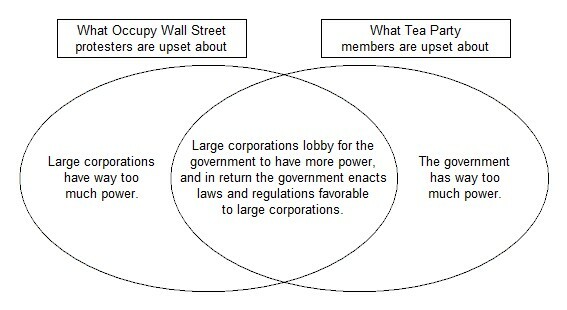 I've got issues with both the Tea Party and Occupy Wall Street--but I'm firmly in the center of this Venn Diagram. It would be nice if we could work together and concentrate on the parts where both sides agree--I think that would help both groups with the parts outside the intersection. I do think there's truth to that. I put it on my FB page. We need to realize it's us--Americans--vs. too-large government and the corporations. Then we need to work together. The problem is the OWSers want MORE governmental control. They want the gov to take from the evil rich capitalists and give it to them. Socialist Marxism is at their core belief. Then there are those who don't' know what they want other than they want a free ride.